NEW DELHI: Over the past few years, ride-hailing service Uber has expanded across the world and gained a massive customer base. To retain users, the company also offers numerous discounts and introduces new features in its app on a frequent basis. One such feature that arguably all Uber users are aware of, is the ability to rate drivers. 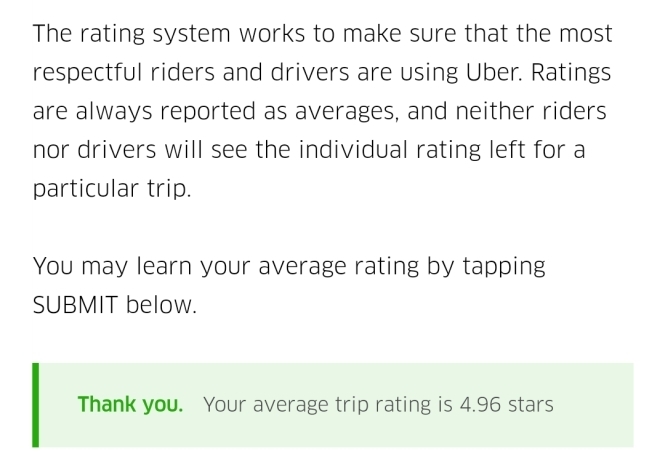 But it also works the other way around, which means it’s possible for drivers to rate customers. Step 1: In the app, tap on the three-line menu icon to access the sidebar. Step 2: Usually the average ratings by drivers can be seen inside the sidebar, just below your name. But if you are still not able to view the ratings, simply tap on the ‘Help’ option. Step 3: Now tap on the ‘Accounts and Payment Options setting. Step 4: Go to ‘Change my Account Settings’ and go to the ‘I’d like to know my rating’ option. Here, you’ll get a brief idea of how the ratings are gathered, along with a ‘Submit’ option. Tap on the option and your average rating will be shown. As for the website, you can go to help.uber.com page and follow the exact same process as mentioned above. Both web and app have a ‘How is my rating determined’ section, in case you need more details. “Ratings are anonymous. Neither riders nor drivers see individual ratings tied to a particular trip or person. Candid, constructive and respectful feedback is beneficial for everyone,” said Uber.